Erin will use her Crossroads grant for CrossFit Level 1 Trainer certification, a step she considers crucial for becoming more active in the adaptive athlete community. She hopes to eventually coach CrossFit for adaptive and other athletes. “I have that knowledge and pool of experience to pull from if anyone asks my opinion on adapting specific movements or asks other personal questions,” Erin said. The grant gives her the opportunity to gain the technical and scientific education needed to become a certified coach. Erin is a congenital arm amputee from just below her elbow on her right side. Her training focuses on improving strength, speed, and confidence. And, although she shied away from Olympic weightlifting when starting CrossFit two years ago, she now wants to compete in a traditional Olympic weightlifting meet and try a Paralympic sport. 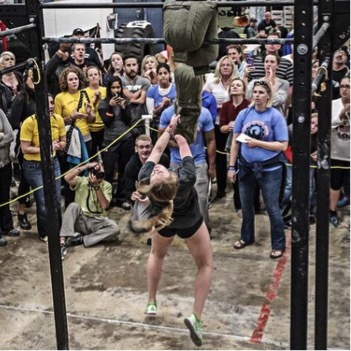 Erin interacts with adaptive athletes regularly and trains at CrossFit Rubicon in Vienna, Virginia.